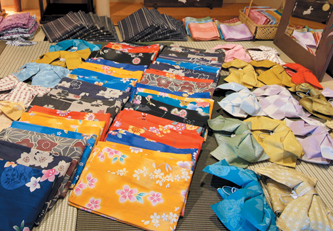 Choose from a number of yukata designs and 'obi' sashes! After taking a bath, we recommend you to change into the yukata placed in your guestroom. The room maid will make sure that the yukata is the right size for you. There are men's kimono and women's kimono, and at some ryokans, you will be able to choose from a number of designs and obi sashes. Sets of yukata, haori and obi are placed in accordance with the number of persons staying in each guestroom. The tanzen and tabi will also be provided depending on the season. You will also find bath towels and face towels, and other amenities for your use. A yukata, which is unlined and made of cotton, is worn mostly in the summer. Putting your arms through the sleeves, gentlemen and ladies alike wear the yukata with the left side wrapped over the right side, and tie the obi sash. At ryokans fully equipped with air-conditioning, you will be comfortable just wearing the yukata in all seasons of the year. But in the cold seasons, a 'tanzen', which is a rather thick padded kimono, will be provided. At a ryokan, you wear the tanzen over your yukata, and in the same way as wearing the yukata. A 'haori' is worn over the yukata or tanzen. It is short in length, and has rather large sleeve-pockets to allow the sleeves of your yukata or tanzen to fit in easily and your arms to move smoothly. This haori also serves as a coat. The tabi are Japanese-style socks. Sets of yukata, haori and obi are placed in accordance with the number of persons staying in each guestroom. The tanzen and tabi will also be provided depending on the season. You will also find bath towels and face towels, and other amenities for your use. The amenities will be arranged on the vanity unit.